Last week I asked: Where can you celebrate your Celtic heritage? 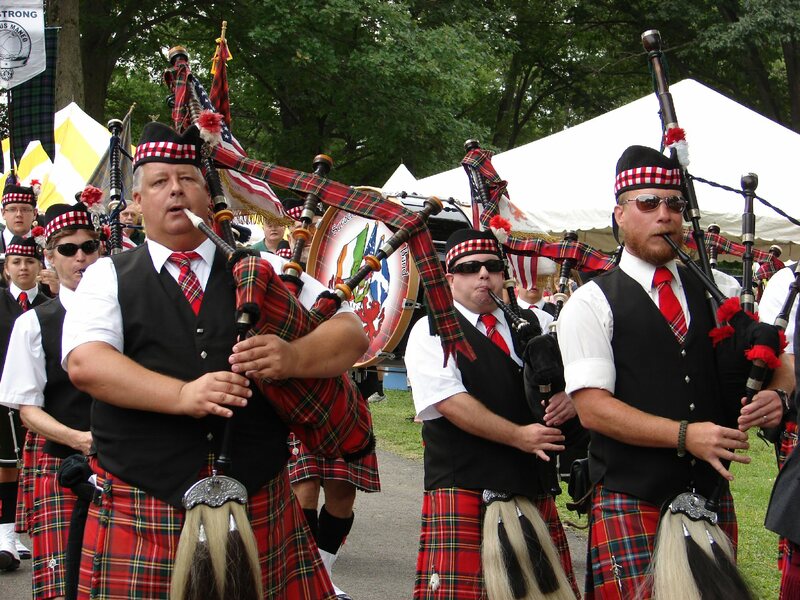 On August 13, Long Branch Park will be the site of the 75th Central New York Scottish Games and Celtic Festival – 75th – that’s impressive. You don’t have to have a drop of Scottish or Celtic blood to enjoy the day. On August 13 at Long Branch Park everyone is part of the Celtic family. Bring the family – there is something for everyone. I had a great time last year and this year’s promises to be just as great. There is music, great food, games, animals and more. The gates open at 9 a.m. and the fun continues until 8 p.m.
Scottish Games typically include competitions, artwork for sale, entertainment, Celtic goods for sale and historical and genealogical information. Scottish games have a long tradition. In days of yore, they were an opportunity for warriors to test their prowess and show off for the ladies. 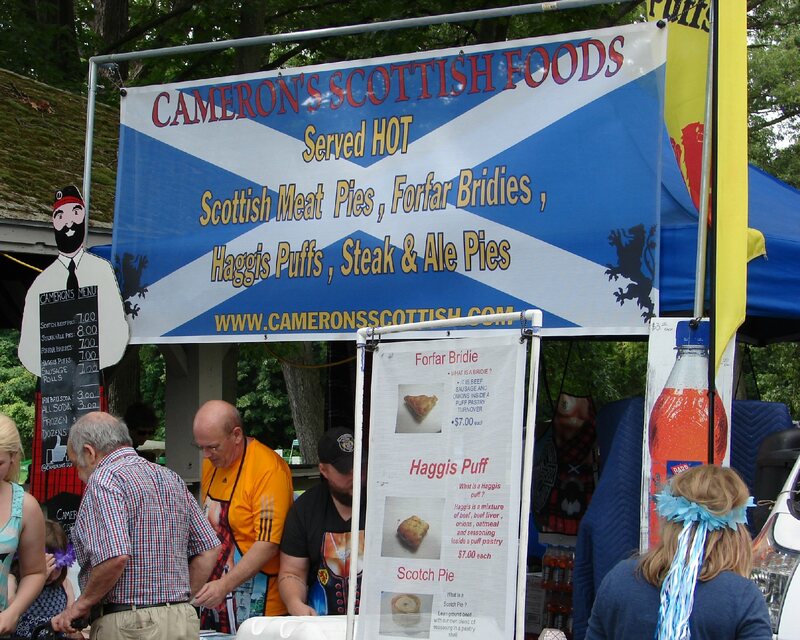 Are you hungry for some haggis ? Today it is time to celebrate and share Celtic heritage and have fun. The sound of bagpipes and drumming fill the air. The competitions include Piping and Drumming, Highland Dance and Highland Athletics. There are several levels of expertise in each of the competitions from amateur to expert. I really love to watch the dancers. The groups come from all over the Northeast and Canada. The contests include the Highland Fling, Highland Sword, Lilt, Hornpipe and jig. The sound of the Celtic harp players is ethereal. The athletic competitions categories include the caber toss which is something to watch. Participants hold a tree trunk upright, run and toss it so that it lands on the opposite end! There is also the stone (think rock) toss. I knew there would be food … and the lines for haggis and bridies were sometimes quite long. 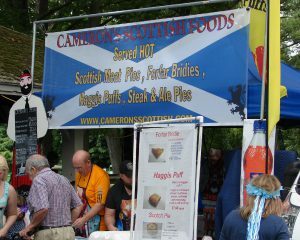 If you have never tried haggis here is your chance. Haggis is a mixture of sheep heart, liver, and lungs mixed with onion, oatmeal, suet, and spices in an artificial casing (it used to be the animal’s stomach). I tried it when I was in Scotland and again at the games. Not my favorite, but one should try it. The less adventurous can try bridies which is a meat pastry made of beef and seasoning. 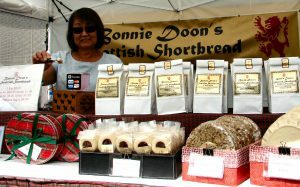 I loved the Scottish short cakes and bought some to take home. There are plenty of other things to eat and drink. There is an American food area and a pub tent. The highland cattle were a big draw. 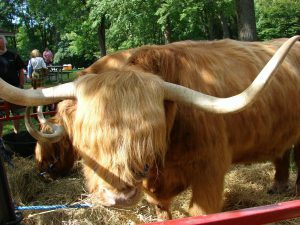 The short, stocky cattle have long horns with a beautiful coat of long brownish hair. They are raised mainly for their meat which is said to have less cholesterol than other meats. 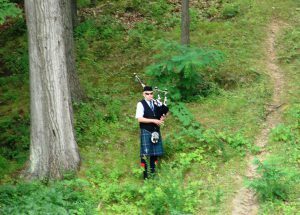 Some of my favorite moments were: listening to a lone bagpiper playing by himself way off in the distance, seeing the families dress in their tartan plaids, and the parade of bagpipe bands in the opening ceremony each sporting their colorful kilts. If you have a hankering to buy a kilt, no worries, there are plenty for sale in all sizes. If you don’t know your clan tartan plaid there is someone to help you find out. 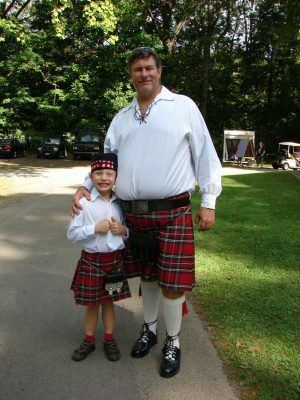 The Scottish Games and Celtic Festival is a full day of family fun for $8 pre-ticket sale (seniors – $6, children 5 to 12 – $3). Bring the family – a family ticket is $25. Gate prices are a couple dollars more; parking is free. Travel Trivia Tease™: What is a mortgage button?